Preheat oven to 425 degrees. Place peppercorn in a small resealable plastic bag. Using a rolling pin, crush peppercorns coarsely and set aside. In a small skillet melt butter and oil over medium heat. Add garlic and sauté for 30 seconds until soft and fragrant. Add rosemary and thyme, continue cooking for 30 seconds. Cool slightly. Stir in panko, peppercorns, and salt. Lightly brush tenderloins with Dijon and press peppercorn mixture along top and sides. Lightly coat a baking sheet with cooking spray, and carefully transfer tenderloins to the sheet. Roast in the oven for 15 minutes or until meat registers 145 degrees. Melt 1 Tbsp. of butter in a shallow saucepan. Add shallots and cook on medium heat until softened (3 to 4 minutes.) Add garlic, and cook one more minute. Add cream, mustard, salt, and pepper to the shallots. Stir together and bring to a gentle boil. Reduce heat and simmer until slightly thickened (4 to 5 minutes). Set aside until ready to serve. 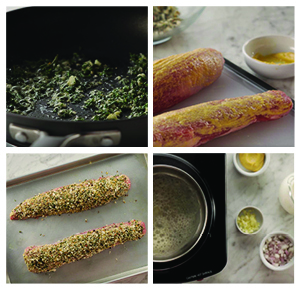 Allow tenderloin to rest 8 minutes, slice and serve with a spoonful of mustard cream sauce.